The short duration compressed air Emergency Escape Breathing Device (EEBD) providing respiratory in toxic and oxygen-deficient atmospheres. Offers a duration of 15 minutes for a safe escape. 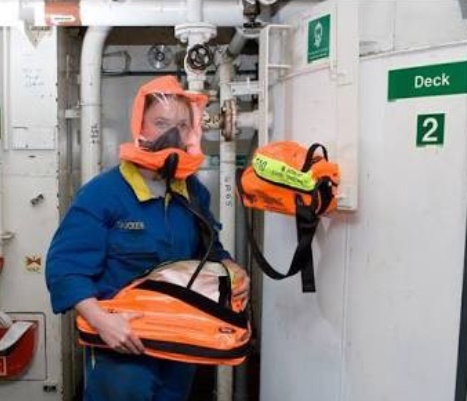 Designed for use on board of ships, in chemical industries, offshore oil rigs, refineries, water utilities and confined spaces compact and very easy to use. It can either be carried by the user or kept in readiness close to the workplace for immediate access in case of emergency. EEBD is supplied in a fluorescent protective carrying bag ensuring high visibility hood with oro-nasal facemask, large visor and elastic neck seal, and a well visible pneumatic end-of-service time indicator turning red before the cylinder pressure is exhausted. - Pulling the strap opens the zipper giving access to the hood, automatically starting the air supply, in one simple action the set is already delivering breathing air to the hood when it is donned. The emergency escape breathing device must have a certificate to EN 1146 for a duration of up to 15 minutes. It meets the International Maritime Organisation (IMO) SOLAS resolution MSC. 99C  making EEBD mandatory on all vessels. Share to help knowledge of seaman. 0 Response to "How To Use Emergency Escape Breathing Device"